Surprising Hearthstone Art: Fen Creeper – AiPT! 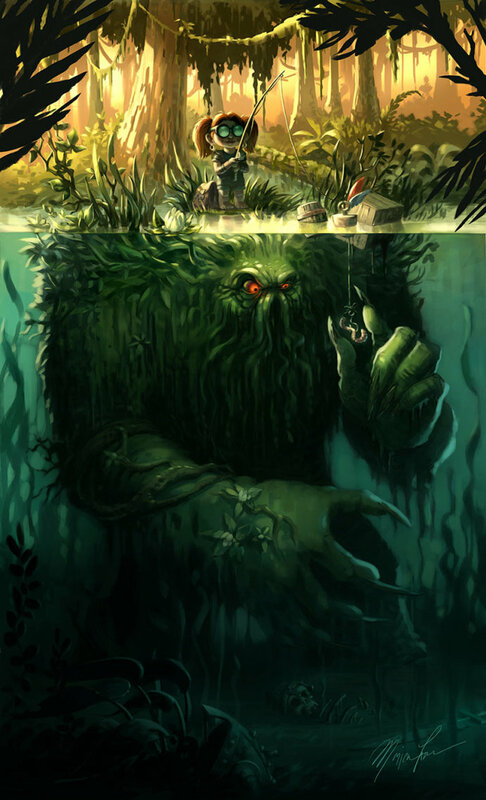 The art for Hearthstone’s Fen Creeper depicts the moments just before inevitable, gruesome tragedy. Or does it? You know the feeling. That unnerving “What just brushed my leg you guys — a piece of pondweed or an eel-shark hybrid ready to tear my damn leg off?” sentiment whenever you have to doggy-paddle through any body of water whose bottom you can’t see. That’s pretty ominous. In case the terrifying Creature from the Black Lagoon/The Heap/Jaws motif and skull, rib bones and broadsword, the only vestiges of some poor schmuck World of Warcraft adventurer (who probably failed a Level 20 Wetlands quest), at the feet of the enormous Bog Beast didn’t clue you in. This is the corrupted version of Fen Creeper. It appears that the unlucky gnome who inadvertently used the top of the Fen Creeper’s head as a fishing spot has also been corrupted and has now gained control of the creeper. The gnome could be the Gnome Warlock Nemsy Necrofizzle, given the matching silhouette and red goggles. Not much is known about Nemsy Necrofizzle, however she is believed to be the Gnome featured within the artwork of the Bog Creeper, riding on its back, as well as being shown within the artwork of the Fen Creeper, fishing. Don’t let Nemsy Necrofizzle’s small size and penchant for peaches fool you: behind those pigtails and goggles hides one of the most powerful Warlocks alive. Nemsy is utterly fearless, sharp as a razor, and she’s always cool under pressure. After all, you can’t command fel energies or summon horrifying demons from the twisting nether just by being nice. She’s your perky little pal–and a bonafide fel-flinging, soul-destroying mistress of dark forces! Nemsy loves it when her foes underestimate her. Appearances can be deceiving, and she knows that it’s what lies beneath the surface that counts. Our take? In some, sick alternate timeline, Lolly the Unsuspecting didn’t make it out of her final, leisurely fishing excursion alive. But Blizzard wasn’t having that in an online collectible card video game for all ages. Lolly, AKA Nemsy Necrofizzle, planned the encounter all along with the hopes of wrangling her very own Bog Creeper minion — the first of what could be many displays of her power in the Hearthstone universe. What’s next for Nemsy and her Bog Creeper minion? Sound off in the comments. Check out last week’s edition of Surprising Hearthstone Art: Chillwind Yeti.